In this post I will explain how can we write MVC 4 WebAPI to perform complete CRUD operations on any data source (In this sample I have used MongoDB). Web API is Microsoft’s promise of completely embracing HTTP protocol. For its reason of being the most simple/basic mechanism of exposing & consuming services, it primarily targets browsers, mobile devices & reaching wide audience. It will show a dialog box enlisting MVC4 Templates. 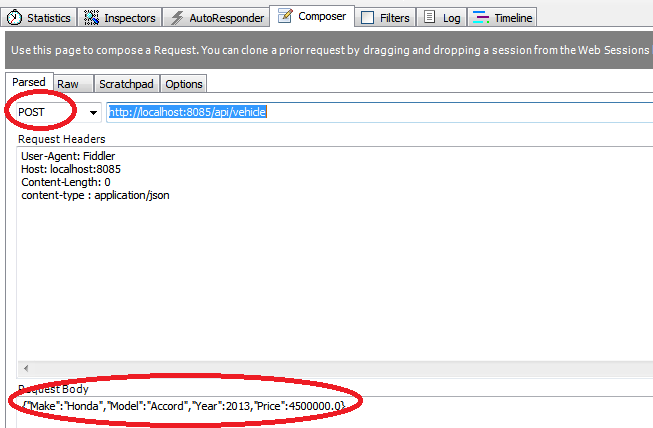 > Select Web API & Click OK.
Today I am interested to work with a Vehicle entity. Therefore add a class with name “Vehicle” in Models Folder & add some attributes. Notice how we have decorated id attribute with BSONId, indicating that this attribute would contain MongoDB document id property. Now we will incorporate Implementation detail of our Repository in Models. Add a class naming “VehicleRepository” . Notice how testData is used to fill some default data. Good times are coming. We have our repository ready. We need to add a controller file to handle HTTP requests. Go to Controller folder > Delete ValuesContainer Class > Add a new controller > Use “Empty API Container” Template. Notice that this container class is derived from APIController. Now we need following definition. GetAllDinasaursByFamilyAndYear(string make,int year) : Returns a list of all Vehicle Objects of a Certain Make & year. Notice how i have named GetAllDinasaursByFamilyAndYear() method which will fetch vehicles of certain make & year. This is to hint that WebAPI has nothing to do with Names , It will search for method starting with GET & appropriate parameters. 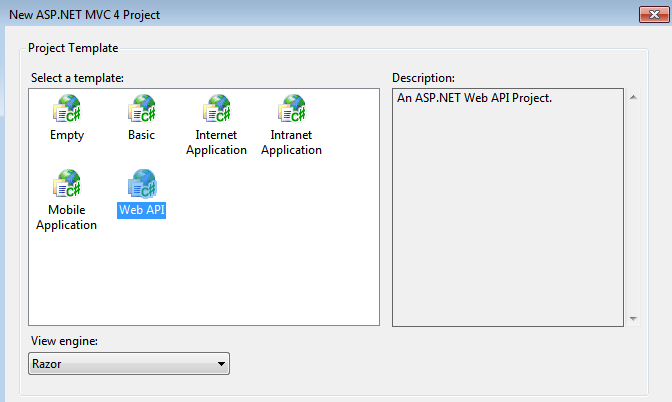 Run your Web API Project from Visual Studio. Launch Fiddler. Go to Composer Tab & provide the URL of your web API. Now you should be able to see a response result in left most result window. Double clicking the JSON result would open the Inspector tab & the JSON result. Now Hit Execute again, You should be able to see a XML result in the results window. Double clicking it would show the same data in XML format. Now provide a filter in URL , under composer tab. 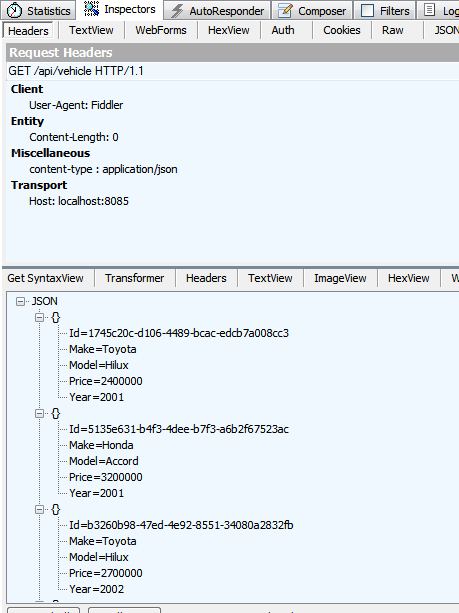 This would result a JSON/XML result listing all Vehicles from Data source from Honda. ( Result format depends on content type we use. Hit Execute to Insert this data in our data source. We need to provide VehicleID & a vehicle object that would be used to update existing values. Hit Execute to Update this data in our data source. You can now use GET requests to see if previous record was Updated correctly into the system. We need to provide VehicleObject ID in URI. Hit Execute to Delete record. You can now use GET requests to validate your DELETE action. *It is very Important to know that the filter values we provide are case sensitive. I hope this post has provided you a quick insight on Implementing CRUD in MVC4 – WebAPI.